Meals are served in family groups sometimes including friends or neighbors. 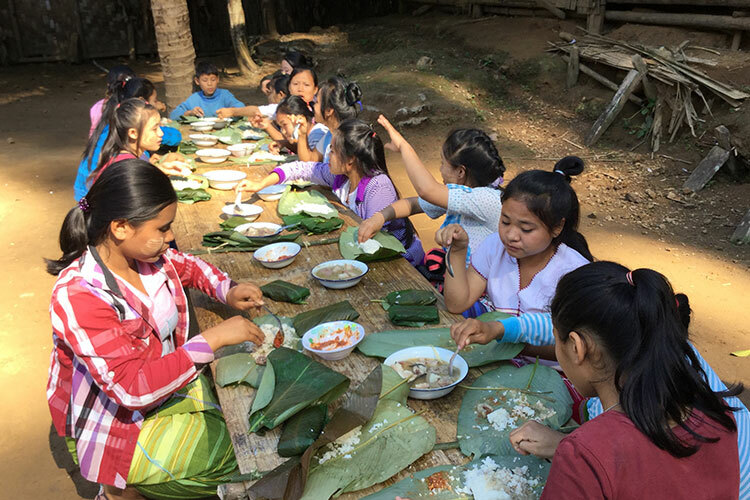 A typical Karen meal includes a large container of rice accompanied by smaller bowls of meat or fish, vegetables, chilies, fermented fish paste, and other foods and spices. Common vegetables consist of squash, bamboo, cucumbers, mushrooms, and eggplants. The fish paste is a famous dish among the Karen known as “nya u” or in Burmese “ngape.” It is a strong-tasting dish of fermented fish pounded into a fish paste, usually served with rice and vegetables for added flavor. Meals are often flavored with chilies and added spices like turmeric, ginger, cardamom, tamarind, lime juice, and garlic.